Spasms in the organs of the smooth musculature (stomach, intestine, gall bladder, uterus and urinary tract); spasticity of the striated musculature (myogelosis, hardening of the muscles). Injection Solution 1.1 ml, also for oral use. Injection solution: 1 ampoule of 1.1 ml (= 1.1 g) contains: Citrullus colocynthis D4, Ammonium bromatum D4, Atropinum sulfuricum D6, Veratrum album D6, Magnesium phosphoricum D6, Gelsemium sempervirens D6 1.1 mg each; Passiflora incarnata D2, Agaricus D4, Chamomilla recutita D3, Cuprum sulfuricum D6 0.55 mg each; Aconitum napellus D6 2.2 mg.
Allergic skin reactions may occur in rare cases. Injection solution: Packs containing 10 or 50 ampoules of 1.1 ml each. 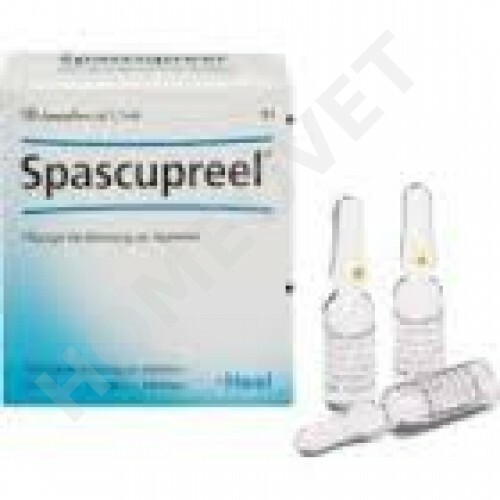 Heel Spascupreel is to be administered oral or by s.c. or i.v. injection.